At Jetabroad, we recently introduced SonarQube, a static analysis tool, into our development workflow. SonarQube finds bugs and "code smells" in our GitHub pull requests, and helps us keep our codebase clean. It's been a great, low-friction addition that's improved the quality of our code. While SonarQube's documentation is great, it can be a bit hard to put together an end-to-end setup. In this post, we'll cover how we configured SonarQube for one of our C# projects here at Jetabroad. 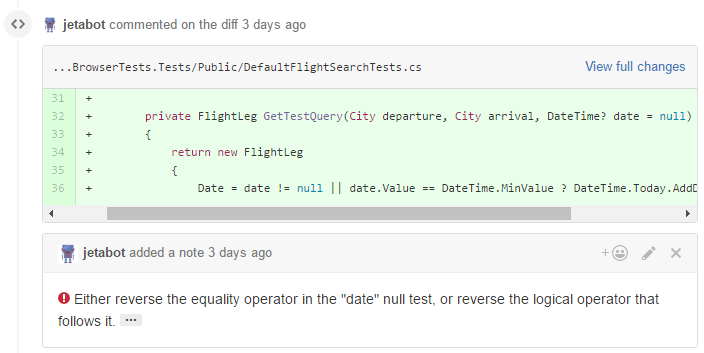 As you can see above, SonarQube detected a boolean logic error in this pull request, which will lead to a NullReferenceException if the date parameter is null. If you were to click the ellipsis symbol at the end of the comment, SonarQube would display a page explaining the issue in more detail. 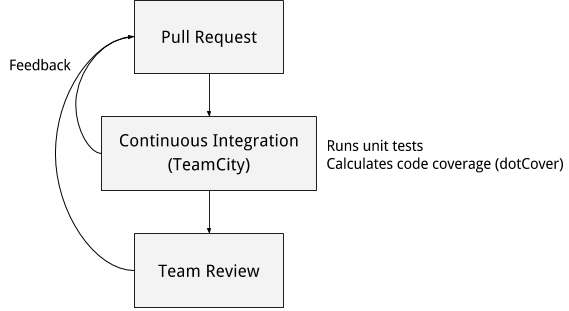 As a prerequisite, this post assumes that you've already configured TeamCity to build your GitHub Pull Requests. If you haven't done that yet, take a look at this blog post from the creators of TeamCity. Don't worry about configuring the plugins right now, we'll do that later. The next thing to do is explore the SonarQube configuration options available to you and change them to your liking. You'll also want to add a project under "Administration → Projects → Management" to represent your codebase. Set the project name to the TeamCity project name (the contents of the TeamCity %system.teamcity.projectName% variable), and the project key to the TeamCity project id (the contents of the %teamcity.project.id% variable). If you don't already have a daily analysis job in TeamCity, create a new TeamCity build configuration in your existing TeamCity project. This new build configuration should do all the typical checkout / build / code coverage steps, but we'll configure it to do a full SonarQube analysis as well. Add a Trigger that runs the build daily. Follow the installation instructions for the plugin, up to the "Configuring SonarQube Build Step" section. Optionally, set "Project Version" to a meaningful number. We set it to the first 8 characters of our git revision hash. Additional Parameters (under Advanced Options): The "publish" mode means full solution analysis. At this point, we should have a full working project analysis! Run the TeamCity build and verify that you get results in SonarQube. Next, let's set up the GitHub Pull Request configuration. Determine what GitHub account you want to use for the automatic Pull Request comments. Create a Personal Access Token using that account. Give the token "repo" permissions, and give the user write permissions to the repository that contains the pull requests, so the bot can leave comments on the Pull Requests. These account permissions are a little bit broad, but unfortunately GitHub doesn't have the fine-grained permissions required to lock this down more. In SonarQube, add the generated Personal Access Token as the SonarQube "sonar.github.oauth" property. There are multiple ways to do this; we chose to enter the token into the dbo.properties table in SonarQube's database. The fully qualified repository name, of the form "Organization/RepoName"
In our build configuration, we didn't have either of those, so we used a PowerShell build step to derive it from variables we do have. This script will derive those two variables, and store them as TeamCity parameters that we can reference later. # This sets variables that tell SonarQube what GitHub PR to analyze. # It is called by the "Set SonarQube Configuration" TeamCity build step. # try to convert the branch name to a PR number. So the branch "54/merge" becomes 54. # want the GitHub plugin to run, so failure is expected and ignored. Now, open a buggy pull request to test this out! 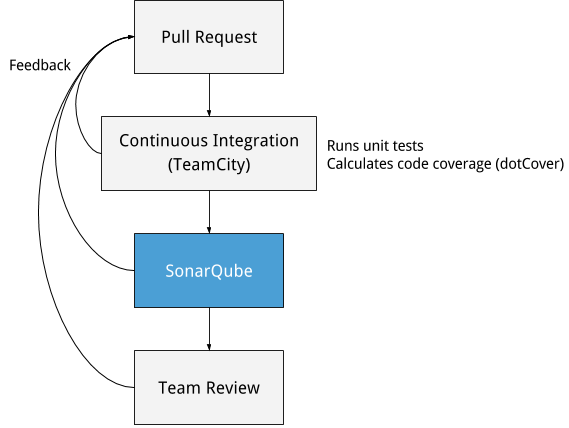 TeamCity will detect the Pull Request and launch SonarQube. SonarQube will analyze the project, and post Pull Request comments identifying the issues. If it doesn't work, you can add -X and -e to the "Additional Parameters" section to get debug output in the TeamCity build log. Files and patterns to ignore: Under "Administration → Analysis Scope", you'll want to exclude various files from analysis. For example, you may want to exclude issues in files that contain the string "GeneratedCodeAttribute". This last line, "localUsers" will make the "admin" account a local user rather than an LDAP user. This way, if you accidentally lock yourself out, you can still use the "admin" user to access SonarQube. Custom SonarQube rules: If you attended our previous .NET Meetup, you'll know all about Roslyn Analyzers. You can use Roslyn Analyzers to add your own custom "code smell" detectors to SonarQube. Install the SonarLint Visual Studio extension: It's a poor developer experience when he or she is surprised by the automated review comments. Developers can install SonarLint in Visual Studio to get the same checks that SonarQube has. It can even connect to your SonarQube server and use the same rule configuration! We're done! Now we've configured SonarQube to help us keep our code in shape. We get daily full codebase scans, as well as scans for every GitHub pull request. Happy hacking!